"SECRET HISTORIES" explored the concept of the social construction and reconstruction of a subject. Central to the exhibition was the sculpture "Resurrection" which was based on the form of a dress. The symbol of the dress is used to signify the concept of 'wearing' your life experience and the links between physical, intellectual and emotional experiences that together construct identity. 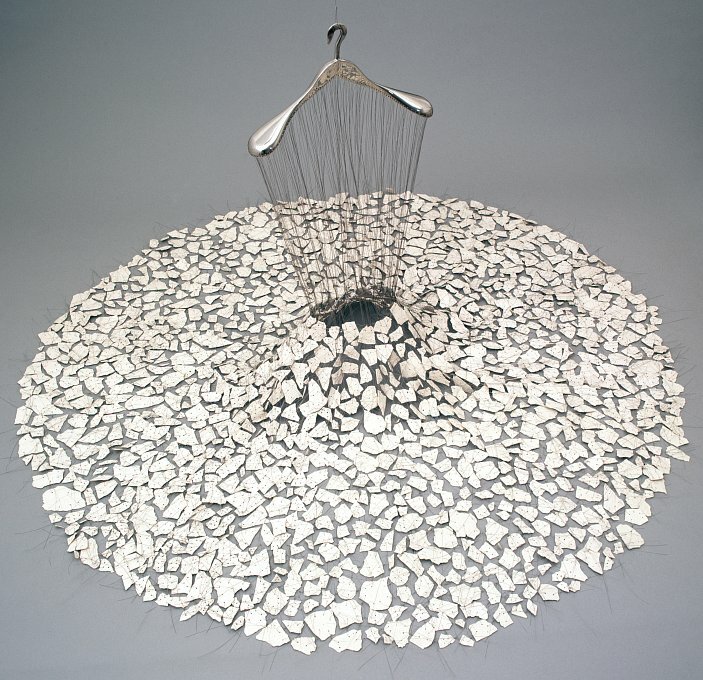 The materials used to construct this artwork add significance to the exploration of this concept. 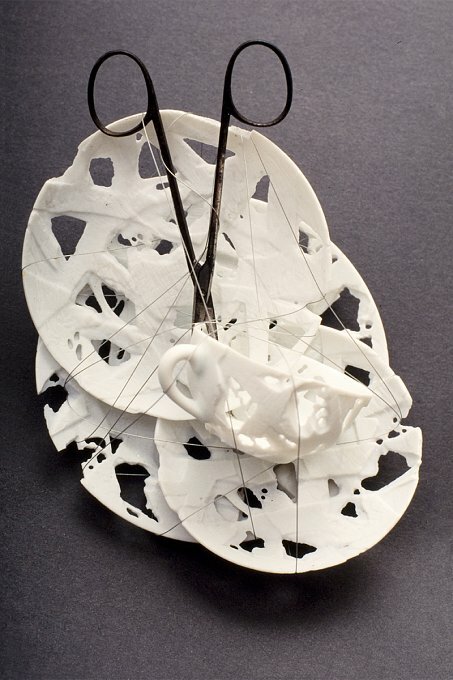 The surfaces of the porcelain shards have all been inscribed, signifying the 'writing' together of psychological and physical experiences. The broken and resurrected shards suggest that this form could have been made from another, and that it could be continually reinvented. The cable ties suggest tenuous hair-like threads connecting and helping to resurrect the shards. 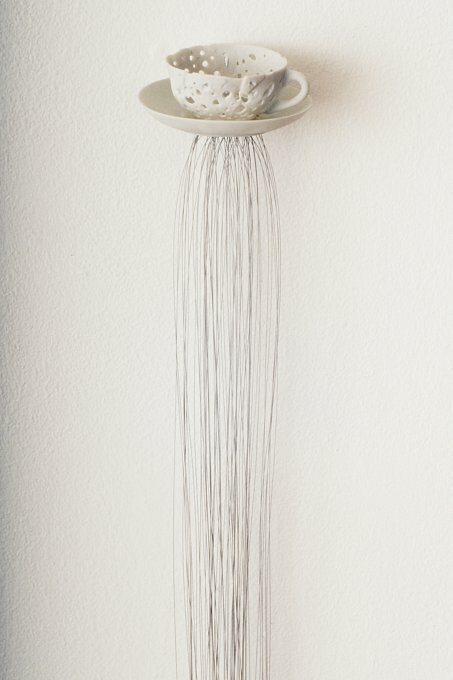 The porcelain and cable have been used to construct a symbol that refers to the physical body, such as the elements of bone and hair. The stainless steel hanger refers to the framing of the 'social' body within certain boundaries and the social structures to which identity is bound and supported. 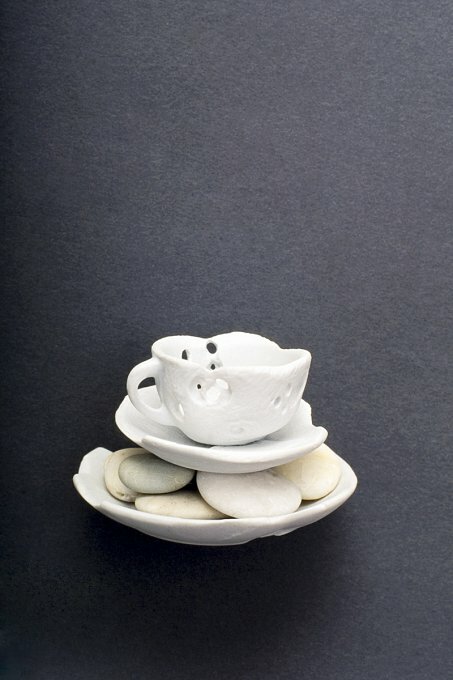 In this exhibition, a series of sculptures were made from elements of child size porcelain tea sets that had been manipulated, cut, pierced and carved, to identify and represent the ritualistic nature of the socialisation process and were wall mounted, so that they looked like they were embedded in the surface of the wall, and part of the structure and history of the subject. They were titled "Bone", "Knot", "Scissor", "String", "Water", and "Scratch" words that suggest the physical experience of construction and the psychological experience of play. 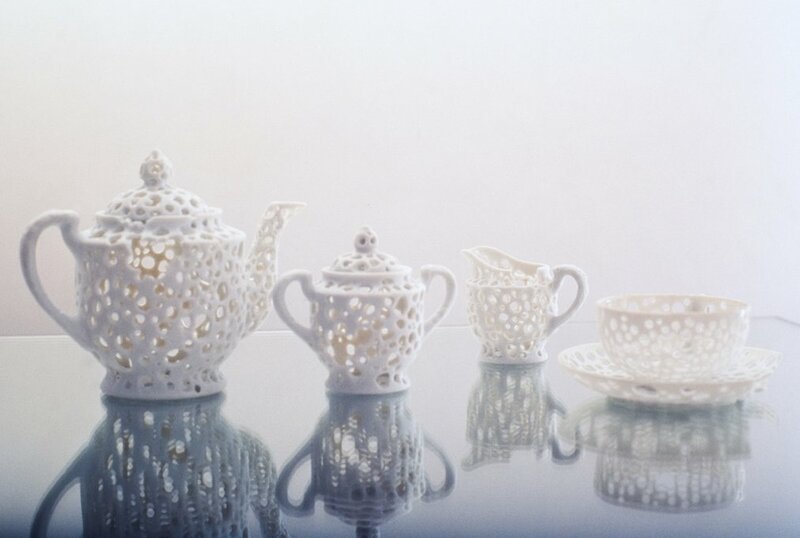 "Trace" took the form of a porcelain tea set for one, with all the elements pierced with holes, making them redundant for their original purpose, but still holding more than a trace of their socially symbolic presence. Kendal Murray lives and works in Sydney. She has exhibited her artwork regularly in solo exhibitions since 1995, whilst participating in both international and national group exhibitions. Her work is represented in public and private collections in Australia, and private collections in Japan, New Zealand, Australia, Hong Kong, the United Kingdom and New York. Kendal Murray is currently lecturing in Design at the School of Humanities and Communication Arts, University of Western Sydney, and is represented by Arthouse Gallery.